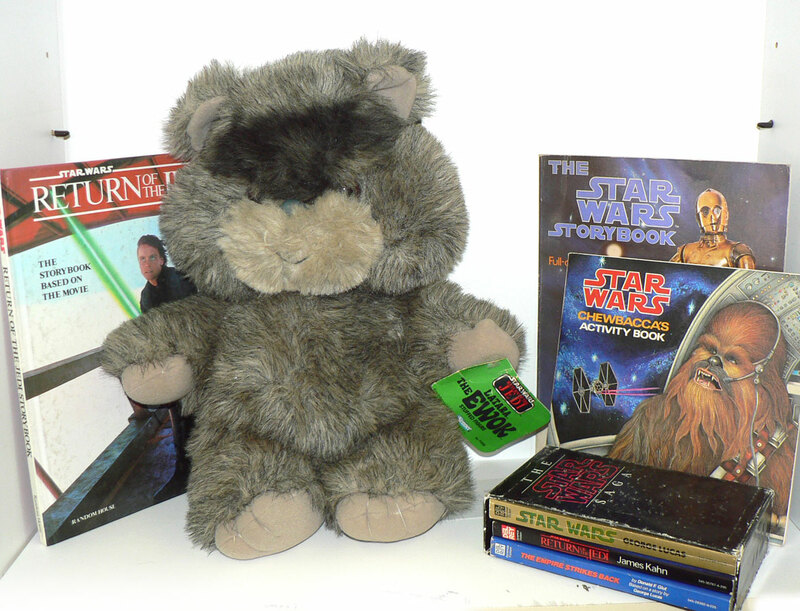 Today's first giveaway is for these six vintage Star Wars books and Latara the Ewok. Gotta toss my hat in the ring for this one! Oh, yeah!! This is awesome!! I know someone who would LOVE this. Latara the Ewok! I'm all about this. The Ewok is awesome looking! Oh my! I'm such a Star Wars fan! Lightsabers crossed for this one! My husband would kill me if I didn't sign up for this!!! I'd much rather have this thathe BluRay. Would love this for my Awesome Star Wars loving hubby! Please. Count me in. My daughter would wave her light sabre to have these! I'm pretty sure I had all this stuff as a kid, and I am KICKING myself for giving it away! Love, love, love this. that Ewok is so cute! Holy Smokes! I live with 4.5 Star Wars fanatics that would be thrilled to win these items! Thanks for being so generous! My 7 year old would love this - thanks for the giveaway! Wow, I would love to give that to my son for Christmas! They look awesome! Count me in, please. This fuzzy Ewok would look great in my wife's library next to Darth Tater. Please count me in General! Wow, this is an awesome giveaway. That ewok is adorable. Gotta sign up for this one!! Great giveaway—thanks for the opportunity to win these amazing goodies! GAH! I so want to win this one!!! We are big Star Wars fans. Thanks for this great giveaway. I think my sister would disown me and take away my geek card if I didn't at least attempt to sign up for this one. Thanks! Love that Ewok !!!! Great giveaway ! So much fun! Count me in! Oh! I want that ewok!!! That is the cutest thing I've seen all day. Pick me! Pick me! We have the blu-ray box set on pre-order! Would love this - thanks for all your cool giveaways! There are tons of Star Wars lovers in our house, me, kiddos and uncles. We'd love this. My husband would love this! I've never seen him more excited than for Star Wars to be out on BluRay. This would be a perfect surprise for him! Love the Ewok! And the books would be fun to read! My 6-year-old would love this Star Wars collection, especially the Ewok! For Christmas he wants everything Star Wars, including the entire series on DVD! Outstanding! I'd love to have this! Our fam of 6 would love this! Thanks for posting.